The central nervous system (CNS) is made up of two types of tissue: white and gray matter. While they may bear strong associations, their differences go beyond what meets the eye. White matter pertains to the area of the brain and the spinal cord that is mainly comprised of bundles of myelinated axons, also known as tracts. It plays a critical role in conducting, processing, and transmitting nerve signals between the different regions of the brain. Meanwhile, gray matter is made up of neutrophils, glial cells, neuronal cell bodies, capillaries, and synapses. Found in the brainstem, the cerebrum, and the cerebellum, gray matter is one of the main components of the central nervous system. Aside from their color, there is a huge difference between white and gray matter. White matter is mainly comprised of bundles of myelinated axons, also known as tracts. Myelin is rich in lipids and protein, and it mainly functions to protect axons and convey nerve signals. Unlike white matter, gray matter contains few myelinated axons. An integral part of the CNS, gray matter is made up of neutrophils, glial cells, neuronal cell bodies, capillaries, and synapses. The most noticeable difference between the white and the gray matter is their color. The myelin sheets present in the white matter greatly attribute to its white color, while the neuronal cell bodies and the capillaries in the gray matter are responsible for its pinkish gray color. Aside from filling in the deep sections of the brain, white matter is also abundant in the superficial areas of the spinal cord. Gray matter, on the other hand, is located deep within the cerebrum, along with superficial areas in the cerebellum and the cerebral hemisphere. Additionally, gray matter is also present in parts of the spinal cord, where it is referred to as the gray column, a structure that greatly resembles letter H.
Simply put, the depth of the positioning of gray and white matter greatly depends on the structure. In the spinal cord, white matter is located in the superficial areas, while gray matter is found deeper in the structure. In most parts of the brain, however, this is reversed. 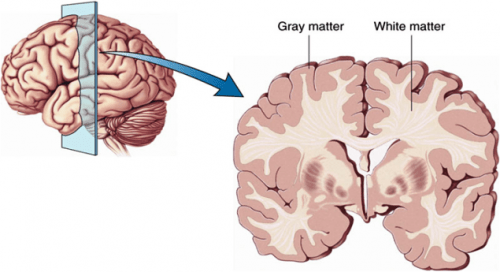 Gray matter becomes fully developed as a person matures and reaches his/her twenties, while white matter continues to grow and develop until a person reaches middle age. White matter makes up 60% of the brain, whereas gray matter accounts for the remaining percentage. Since it aids in processing and transmitting nerve signals between the different regions of the brain, white matter is mainly responsible for learning and cognition. Gray matter, by comparison, occupies parts of the brain involved in sensory perception, muscle control, self-control, decision-making, memory, and data processing.